Mobile applications are playing a vital role in day to day life, with the growing number of people accessing the Internet via smartphones and tablets, mobile apps have the unique ability to access many potential consumers. Android apps live in a highly fragmented multi-device world. We’ve developed hundreds of cool Android apps on releases from Gingerbread to Nougat, simple phones to custom devices - we’ve achieved it. Our team addresses rapidly changing business and technology needs by building Android applications tailored to meet strategic business objectives.Accessing wide range of tools and technologies we create customized applications which are powerful and scalable for any android devices. iOS devices are very popular for their superb performance and the most practical features which users love. The business visionaries see the iOS applications as the lucrative resource to uplift business. Success can be achieved with the right app, right functionality and delivery at the right time. Our team of developers holds an expertise to meet the stringent App store standards and optimally utilize the platform for the best results. We expertise with Swift, C and Objective-C. When we look at the end-to-end process of developing a mobile app, it comes down to a number of major things and we know the vital role a well-documented process plays in quality app development. We meet your representatives and make sure we understand all your requirements carefully. We analyse your requirements and come up with options that you can choose from. We do a lot of discussions and planning to make sure we come up with a design that satisfies all your requirements. Our innate understanding of users and their needs is enhanced by our focus on only mobile users and our integrated production process. Our experts consult you on Apple’s Human Interface Guidelines and Android Design principals to create the best experience for your users on each platform. We will use the native or cross platform programming as per your requirements. At this stage, the front-end design is translated into code as per pre-defined functionality. We follow a process of iterative and incremental development as it ensures excellent quality. Our developer must set up server, databases, APIs, and storage solutions for the App according to the plan. All the required functionality of the app will be developed at this stage. You will constantly be updated about the progress during the stage. Testing is done on codes written, against the requirement specifications provided by the clients for quality assurance. Testing ensures the product meets the requirements gathered during the requirement phase. We test the app under various environments and conditions to make sure that the app isn’t released with major bugs or crashes, and that real users are comfortable with using the app. It comprises of Unit testing, integration testing, system testing and user acceptance testing, all of them important for any project to succeed. Both Apple Store and Google Play Store have exact policies regarding what needs to happen marketing-wise, so that the product reaches the end-users. Our developers are aware of the submissions cycle and guidelines of all app stores, which ensures the apps smoothly sail through the review process. Because App Store submissions can be tricky, we help with the entire submission process to ensure your app is launch-perfect. Your product needs nurturing and we provide continuous support for your success. After launching your app, it is important to get feedback from the end users so that you can make future updates to the app and incorporate feedback on the changes. We provide 24/7 support across time zones. 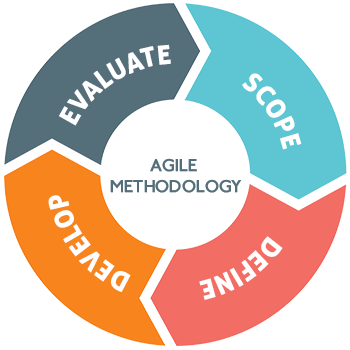 Agile development, in its simplest form, offers a lightweight framework for helping teams, given a constantly evolving functional and technical requirements, maintain a focused delivery of product. 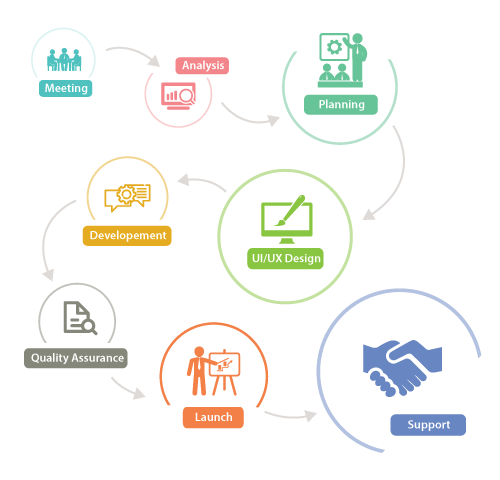 Replace the “waterfall” approach to mobile app development by using agile methodology. Get user feedback early; iterate often; validate your app use case prior to launch. Make changes rapidly without extending your app development budget or timeline. Version your apps on-the-fly; update content in real time. Browse through some of our mobile app designs and check out the apps focusing on usability and user experience.